Narrative: Red box with markers and pencils. The red plastic case was purchased new from Muji in SOHO in 2005 when I worked at the New Museum as a security guard/docent. The markers bodies, caps, and plugs are formed from plastic resin. The marker reservoirs are formed from polyester. Powder and water are used to form the felt writing tip. In addition, markers require ink, and the pigments and synthetic substances used to make it. Toluol and xylol are synthetics used as solvents in dye as well as chemicals such as cyclic alkylene carbonates. Conventional additives, such as nonylphenylpolyglycol ether, alkylpoly-glycol ether, fatty acid polyglycol ester, or fatty alcohol ethoxalates, and preservatives, such as ortho-phenolphenyl and its sodium salt, ortho-hydroxydiphenyl, or 6-acetoxy-2,4-dimethhyl-m-dioxane, may also be added to the mixture. To make the body of the marker, plastic resin is injection-molded into a marker body. Marker caps and plugs are formed in the same manner as the barrel. The nib, or tip, of the marker is made from powder mixed with water, molded, and baked into its pointed or flat form. Using one machine for all the following functions, an assembler then places a polyester cylinder inside the marker barrel to form a reservoir for the ink, fills the reservoir with ink, and inserts the nib at the bottom and the cap at the top. Eraser rubber may be natural or synthetic. Natural rubber is obtained from latex produced by the rubber tree (Hevea brasilienesis). The most common synthetic rubber is derived from the chemicals styrene and butadiene. Styrene is a liquid derived from ethylbenzene. Ethylbenzene is usually made from ethylene and benzene, both of which are derived from petroleum. Butadiene is a gas, derived either directly from petroleum or from substances known as butanes and butenes, which are derived from petroleum. Other ingredients added to rubber include pigments that change the color of the eraser. White can be produced with zinc oxide and titanium oxide. Red can be produced by iron oxide. Many other colors can be produced with various organic dyes. An important ingredient added to almost all rubber is sulfur. Sulfur allows rubber to be vulcanized. Various other ingredients may be added to rubber. These include vegetable oil, to make the rubber softer and easier to shape, and pumice, a natural mineral which makes the eraser more abrasive. Petroleum refineries; Power generation and supply; Plastics material and resin manufacturing; Coal mining; Alumina refining and primary aluminum production; Other basic organic chemical manufacturing; Oil and Gas extraction; Motor vehicle parts and manufacturing; Truck transportation; Oil and gas extraction; Iron and steel mills. Land use includes: Logging; Forest nurseries, forest products, and timber tracts; Cattle ranching and farming. 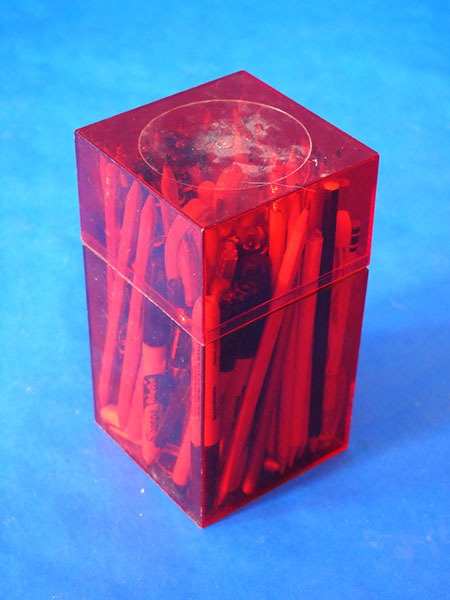 The red box was purchased at Muji in 2004. I don't know how most of these writing utensils came into my life, many were gifts, many were found, none were purchased.